The Bureau of Land Management is hosting a public meeting in Anchorage today to gather input on a draft environmental impact statement (EIS) focusing on a strictly limited oil and gas leasing program for the non-Wilderness portion of the coastal plain of the Arctic National Wildlife Refuge. In the 1980 Alaska National Interest Lands Conservation Act, Congress identified the coastal plain for its potential oil and gas resources. ANILCA expanded the refuge and as part of a grand compromise, created eight million acres of wilderness, while setting aside 1.5 million acres for potential drilling. A 1987 Department of the Interior report recommended the non-wilderness portion of the coastal plain be open to oil and gas development. Since completion of that report, oil field technologies have significantly evolved, greatly reducing the footprint of development. By law, the footprint of production and support facilities will be limited to no more than 2,000 surface acres at any given time, including private land holdings. This is equivalent to only 0.01 percent of ANWR’s 19.3 million acres. Future actions, including potential exploration and development, will require further analysis. As a result, decisions evaluated in this leasing EIS and its Record of Decision would not authorize any activity associated with exploration and development. As much as 60 square miles can now be developed from a single 12- to 14-acre gravel drill site. New drilling capabilities are being developed that may increase the subsurface development possible from the same size drill site to as much as 150-plus square miles. The effect is an ever-decreasing impact on surface resources. 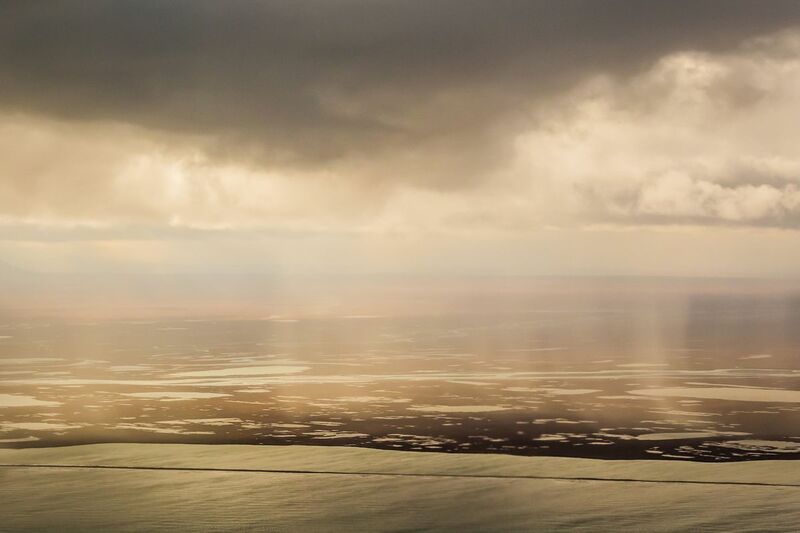 Thanks to the continuing improvements in technology, practices, and oversight, the oil industry has demonstrated during the past 40 years that North Slope energy development and environmental stewardship can and do coexist. The industry has a proven track record of responsible development in sensitive areas, while protecting the environment, wildlife, and subsistence needs of local residents. In fact, many wildlife populations have grown or remained stable. One example is the Central Arctic caribou herd at Prudhoe Bay, which has grown by an order of magnitude since development began in 1970. Oil development, utilizing a minuscule portion of the non-wilderness coastal plain, would create thousands of jobs, generate billions of dollars in government revenues for vital public services, grow every sector of our economy, and further improve energy security for decades into the future. Because the coastal plain is only several miles from existing North Slope energy infrastructure and less than 60 miles from the pipeline, development of energy reserves there would be one of the most efficient ways to increase oil production in Alaska and refill the trans-Alaska oil pipeline, our economic lifeline, now running at three-quarters empty. Limited oil and gas exploration and development on the coastal plain is consistent with the intent of Congress in the passage of the 2017 tax act, the passage of ANILCA in 1980 and the Alaska Statehood Act of 1958. Alaska became a state based on the congressional intent that through development of its natural resources it would be able to sustain its economy and not become a ward of the federal government. Some have argued Alaska’s oil and gas resources should remain in the ground. We respectfully disagree. Alternative forms of energy are a growing part of America’s energy portfolio, but new oil and gas production will be required to power America’s economy and security needs for decades. In fact, the Department of Energy estimates fossil fuels will still account for a majority of America’s energy production in 2050. Meanwhile, new oil production from Alaska, with strict oversight, can serve as a bridge until renewables are established as a dominant energy source. The alternative is to import from overseas where the carbon footprint is often larger. Polls have consistently shown Alaskans overwhelmingly support responsible oil and gas development on the coastal plain. The diverse interests authoring this column support such development because harvesting our world-class energy resources in this area would help secure Alaska’s future and revitalize our great state. Unfortunately, the recent Fairbanks meeting did not demonstrate our memberships’ shared belief that responsible oil and gas development can occur on the coastal plain. At the meeting, activists quickly interrupted the formal presentation, took over the meeting, shouted at officials, and waved banners. It had a mob rule feel with an activist group taking control of the microphone and podium. The conduct of the activists was disrespectful, and portrayed Fairbanks in a poor manner. They ignored the meeting rules, setting a bad precedent in their efforts to disrupt the process. Their actions demonstrate they will use virtually any tactic to obstruct and derail open and fair debate. Decisions are influenced by those who engage in the process, so please express your support for a reasonable and thoughtful leasing program on the coastal plain. We believe the proposed program analyzed in the draft EIS represents such a program. Rebecca Logan is president and CEO of the Alaska Support Industry Alliance. Kara Moriarty is president and CEO of the Alaska Oil and Gas Association. Marleanna Hall is executive director of Resource Development Council for Alaska, Inc.
Kara Moriarty is president/CEO of the Alaska Oil and Gas Association, a non-profit trade association.